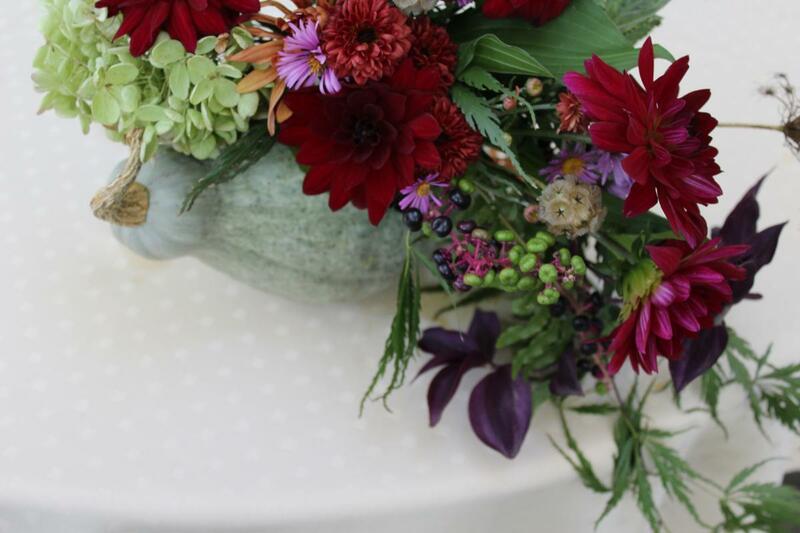 Look out Martha; floral designer Jillian Arquette-Gallagher teaches us to tackle the fall table, New England-style. No place I can think of does autumn better than New England. The flora and foliage is our reward for surviving another chaotic summer of snarled traffic and shark sightings. Now that the threat of heat waves has passed, we are all more inclined to incense our kitchens with the fragrance of baked goods, mulled ciders and... flowers. I may be alone in that last bit; flowers are often considered a luxury of the summer months. But floral centerpieces are a luxury that I have come to consider a necessity. And not just because I make my living as a florist! A wise man once told me "you eat with your eyes first.” Never were truer words spoken. After years of concocting mediocre-looking mains for friends and family, I finally realized that I might be able to exercise this concept in a different way, through flowers! Happily, cooler weather means your DIY arrangements (or those purchased at a shop) will last longer. But there are a couple of different ways to ensure that your flowers’ fleeting beauty last even longer. First, make sure to include some long lasting edibles like apples, gourds, garlic heads, or squashes, which lend texture and seasonal interest. Second, consider incorporating something that's living, like a succulent, or air plant, which have a beautiful array of patinas and will live long enough to make an appearance in your holiday design during the dredges of winter. Whether you are a master chef or want to make that rotisserie chicken from the market feel more special, here are some of my top tips for DIY fall arrangements. 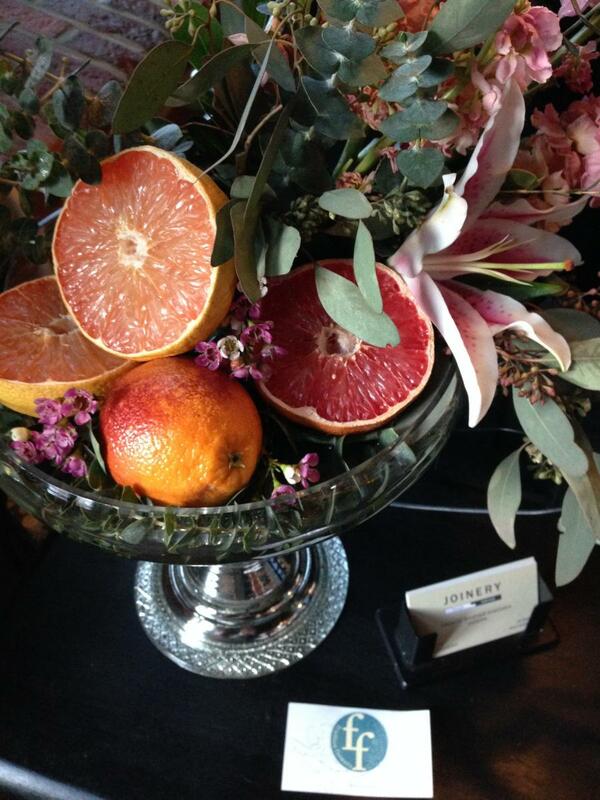 I promise that a simple, seasonal arrangement will make everything on your table taste better. The container really makes the design. Carefully consider what you will use in advance; be it Blue Hubbard squash, copper compote or yard-sale vase. Once you have something that works well for you, keep it! This is the only element of the design that will last forever—unless you use that fall squash. Many designs require some chicken wire to help the stems stay put. Although the use of floral foam is popular among most florists, the green, water-absorbing foam contains formaldehyde—not something that will ever have a place on my dinner table! After curling the sharp ends in and creating a small, single layered ball of chicken wire, push the wire (sharp ends down) into your base. Once the bulkiest pieces are in place, wire a succulent or air plant onto any exposed chicken wire. I like to avoid piercing the plants so that if I have a dinner guest who expresses interest, I can easily release it and give it away as a little favor. Consider incorporating some big "face" blooms like an ornamental cabbage (whose veins of purple or white lend a subtle color tie-in), my all-time-favorite dahlias, or football mums—because what's more fall than mums and football? If the frost hasn't bitten your garden, cut some hosta leaves, Japanese maple boughs, faded hydrangea, ground nut, or pokeweed for interesting foliage and texture. Enjoy the pods that come after flowers like scabiosa and Queens Anne's lace have bloomed. This time of year offers an abundance of materials for free, if you're willing to pull off the highway for those pampas grasses that thrive in ditches, or wrestle some bittersweet vines from a chain-linked fence. Seek out blooms in the store if that's more your speed! Many grocers have begun to carry seasonal bouquets which may have brown button mums, goldenrod, or aster—all staples of the autumn floral palette. And while you’re shopping, don’t overlook the produce aisle; I’ve been known to incorporate a cross-cut grapefruit, artichoke, or stalk of brussels sprouts into the mix. Born to a beekeeper and a florist’s bookkeeper, Jillian was destined to be surrounded by blooms. Gardening has long been her love. An education in color and design gives her a unique approach to how to source blooms and compose arrangements. Fruition Flowers brings the colors and textures of the outdoors in; seeking locally-sourced flowers, foliage, fruit, plants and pods—whatever materials are best suited for the season and setting of your event.